I was reading Retrospace and it showed me something I hadn’t seen since I was a kid. It was the Total Body Shaper and my parents had one in the Seventies. It hung on the door to the crawl space and furnace room for YEARS. My parents used it sometimes, but mostly, it was just an irritating pile of strings on a door handle. 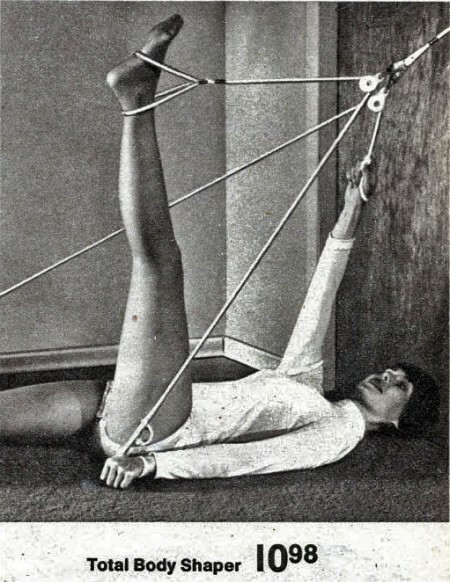 Now, it’s all well and good to laugh at that old exercise product. Weren’t my parents funny back in the Seventies? They didn’t realize how silly that thing was. 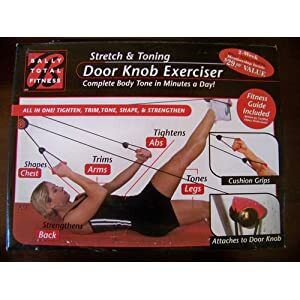 They cost about the same money as they did back in the Seventies, but I don’t think they will give a better workout to you than they did to my poor mom and dad. Don’t let companies take your money with promises. Sure, they’ve changed the name from Total Body Shaper to Pilates Workout, but in the end, they’re still selling the same thing: empty promises. Beautiful Women posted this little info graphic that gives you a bunch of reasons to pick up a jump rope and use it for your next workout. In just 15 to 20 minutes, it will give you an unparalleled total body workout. A lot of muscles are being worked at the same time. This can create muscle tone and definition. To make workouts more challenging and intense, you can use a weighted jump rope. It enhances performance in any sport. It’s also great for eye-hand coordination, lateral movement, foot and hand speed and agility. It can be used at the beginning of workouts for a warm-up. Passive rest breaks in between lifts can be substituted with rope-jumping sessions. This can keep your heart rate up and promote more weight loss. Jump rope workouts can be effective in helping you lose weight and reduce your disease risk. 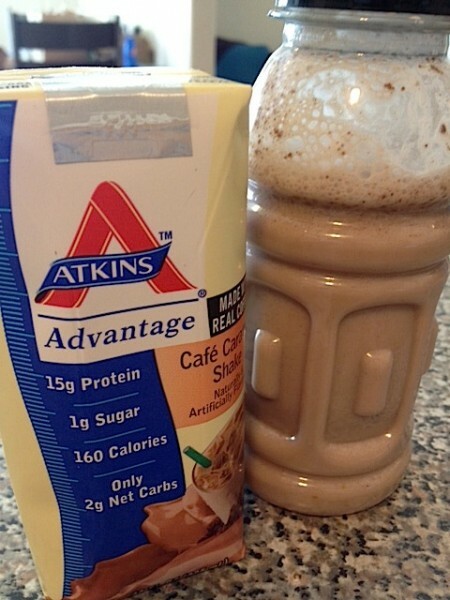 There is something in the Atkins low carb shakes that hurts my stomach. I have NO idea what it is, but it really doubles me over within an hour of drinking one. Not to mention the fact that they just taste wrong. Sure, they’re sweet and taste kind of like chocolate (or vanilla or caramel coffee), but they just don’t taste as good as I’d like. I absolutely adore this motivational poster from Healthy is Classy. Success is the sum of small efforts repeated day in, day out. It’s true. It doesn’t take much to be fit and thin. It just takes doing it EVERY day instead of one or two days a week. The next time you’re thinking of skipping out on your workout, remember that it’s not enough to follow your regime some of the time. You must do it EVERY day to see results. 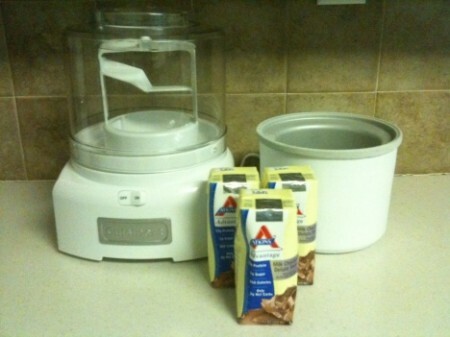 When his wife bought an ice cream maker, the writer at Low Carb Confidential wanted to know, Can You Make Ice Cream With Atkins Shakes?. Despite the warning on the shakes, he decided to give it a go. Unfortunately, it ended up a chunky mess. Ironically, making low carb ice cream is pretty easy. 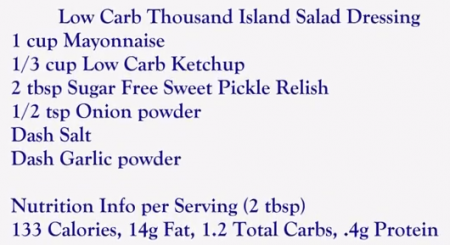 There are a bunch of recipes on the Low Carb Friends forum. Here are a couple of my favorites. 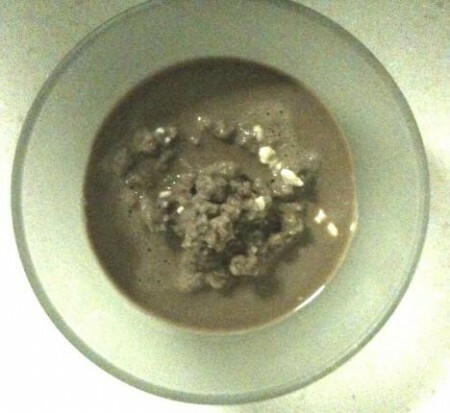 Mix all thoroughly and put it into your ice cream maker. Turn on and watch for about 25 minutes – it should slow to a halt when it’s thick enough. 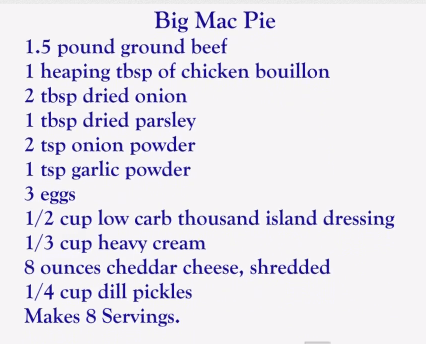 You can easily double the recipe if you’d like. Mix all thoroughly. Cook in a saucepan over low heat. This won’t thicken as much as a sugar-based custard will, but it will thicken so stir regularly. Cook 15-20 minutes until medium thick. Now put it in the fridge to cool down for at least an hour. Put the mix into your ice cream maker. Turn on and watch for about 25 minutes – it should slow to a halt when it’s thick enough. Place a handful of strawberries in a blender or food processor to create the strawberry juice/puree. Mix the first 5 ingredients and add to machine, add the coarse strawberries once the mix has started to firm up. If the mix is not solidifying, add 1 tsp of water and mix it in well with a rubber spatula, make your own determination of how to safely do this with the type of ice cream maker you have. Be careful, though, some of those recipes use ingredients from Atkins products (like low carb peanut butter cups) and the carb measurements might not be accurate because they are using the Net Carbs. I love this photo from Melissa’s Running Inspiration Pinterest Page. It’s an advertisement for a hated brand of shoes and clothing, so I won’t mention it here, but the sentiment is so motivating that I just HAD to post it here. The next time you think, “I’ll start my diet and exercise tomorrow,” STOP yourself! Stop right there and start NOW. Do a quick twenty-minute workout. Plan your meals for the next day and even prepare your lunch so you won’t have an excuse later. 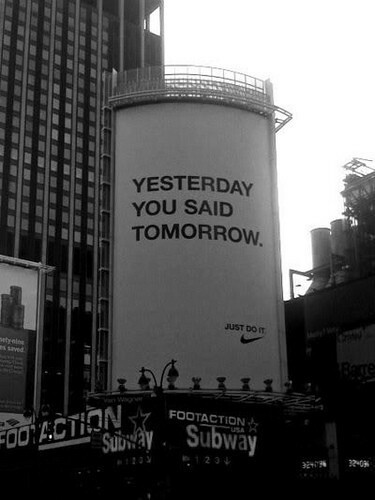 You can always do something NOW, so quit putting your life on hold until tomorrow. Be Yourself? Worst Advice EVAR! FINALLY someone else is talking about how bad the advice to “be yourself” is. Be myself? Right now, I’m overweight. I don’t exercise enough. I struggle with eating food that is poison to my body. I don’t want to be that self. The advice I need is to be better than myself until I’m so used to being that person that it finally feels like myself. When Mike and I were visiting Little Rock, Arkansas, last month, we had a chance to ride bikes across the Big Dam Bridge. The bridge rose 90 feet up into the air, spanning across the Arkansas River and I REALLY wanted to make it across the whole thing. 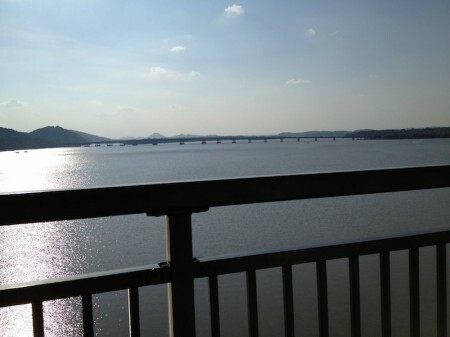 When I arrived there, however, I realized that this was a bigger feat than I thought it would be. 90 feet is just a number in my head. 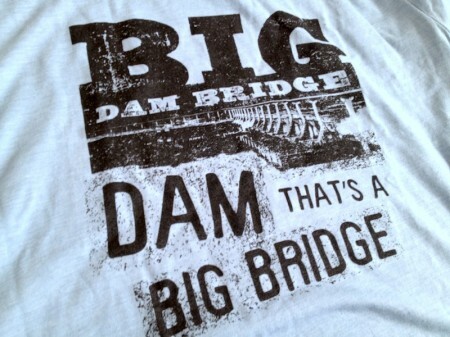 It wasn’t until I actually SAW how tall that bridge was that I fully understood how big of a job this ride would be. I worried that I wouldn’t be able to get across it, but I did. I got across and back and the view was totally worth it! 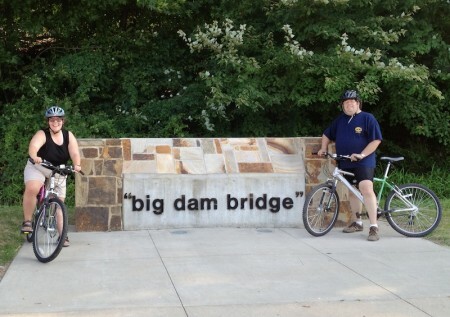 I’m pretty sure that if the bridge had been at 4,200 feet (like back home in SLC, UT), I wouldn’t have been able to do the whole ride, but being at such a low elevation (335 feet), I felt like superhero! I was so proud of being able to get across the bridge, I bought myself a t-shirt commemorating it! 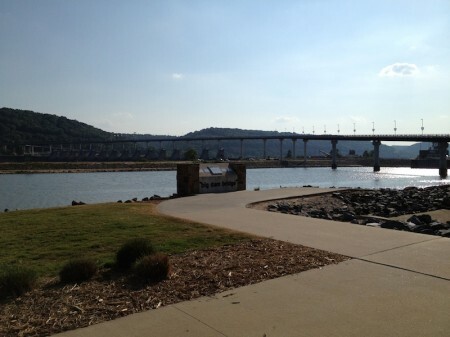 Whenever I’m exercising at home, I need to remember that THIS is why I’m doing it: so I can see great things like the Big Dam Bridge when I’m traveling.